Russia’s campaign to influence U.S. elections and help Donald Trump get elected must not be any big deal to Colorado’s Republican Senator Cory Gardner, who joined Senate Republicans in blocking an attempt by Democrats to include $250 million in the appropriations bill to help states upgrade their election security. The measure would have paid for states to replace their outdated, insecure voting machines, offer security training to election workers, upgrade voter registration software and fund other election security initiatives. 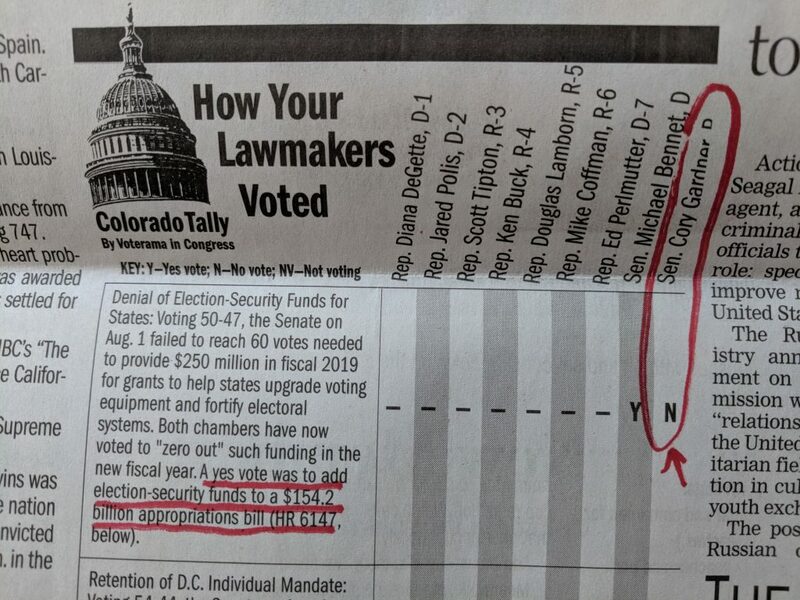 All of the Democrats in the Senate voted for the measure, but Senate Republicans, including Cory Gardner, voted it down. Next time your Republican elected officials boast that they are patriotic and love their country, remember this shameful vote.